Experience the shame and the laziness of copying indie developers. Poor Vlambeer. The Netherlands-based indie duo often likes to develop its games in the open, releasing public betas for feedback. However, that openness is an invitation to the more vicious elements of humanity. Thus, long before Vlambeer ever finished Ridiculous Fishing, someone else rushed out Ninja Fishing. That not only resulted in lost sales, but also accusations that Vlambeer were the ones cloning games. It happened again earlier this year when Luftrausers was ripped-off as SkyFar. Now, you can experience the laziness and the shame for yourself with Vlambeer Clone Tycoon, a browser game that simulates procrastination as much as it does being a scumbag. Developed by Rik Nieuwdorp and Martijn Frazer, Vlambeer Clone Tycoon allows you to "blatantly rip off Vlambeer's games for your own benefit". 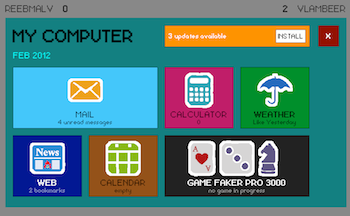 After dumping you into a lo-fi Windows 8 desktop, you can get to checking up on the latest Vlambeer game to start copying, or you can just browse news headlines and check the weather. Careful, because with every action you take, a month passes, making this a shockingly accurate portrayal of procrastination. Once you finally get around to making games, you can decided to make your own assets, or just rip off the official ones with minimal effort. Remember: if you can't ship before the real game does, no one will buy it. Oh, and if you lose, there's a chance you'll get published on the official Vlambeer Clone Tycoon Twitter feed. More games should use public humiliation as a game mechanic. For the record, Vlambeer has this to say on the cloning: "We shouldn't attack cloning. We shouldn't try to take down clones. We should approach it from a constructive perspective... We should improve game literacy, and build a foundation for creativity. We should offer insight into the game design process, talk about design in depth." I suppose that's the kind of level-headed thinking afforded to you when you don't have to justify hundreds of millions of dollars to a board of investors.